Masonic Place Mats, A4 size, are a great addition at the Festive Board to welcome your all-important visitors, and also at your Ladies Evening. 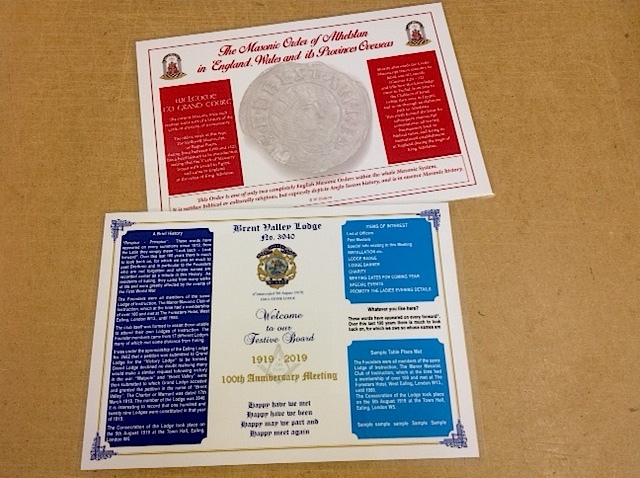 Personalised to your Lodge as required, incorporating perhaps a potted History, or other interesting Lodge information, Special Meetings, Installations, etc. Produced on a heavyweight card, these Place Mats can also be laminated for long lasting and future use at just an additional £1 each. Contact us for a firm quotation if you require a specific quantity or laminating etc. Prices include artwork origination, vat and delivery to a UK mainland address.